Here at Catalyst Condo Management, we make it a point to hold ourselves to a higher standard. We don’t just mean this with regards to condo management – although, of course, this is a goal that we’re constantly striving after in our day-to-day work – but in how we carry ourselves within our communities, as well. We always push ourselves to go the extra mile and do what we can to truly support the people, families, and individuals who live in our communities whenever we can. We just don’t know how to do things any other way. We’re a condo management company – so, why don’t we just stick to what we’re good at and manage condos? Well, we do a lot of that, and are pretty darn good at it, if we do say so ourselves. In fact, a number of initiatives we’ve launched over the course of the past year have been focused just on that: educating, inspiring, and advocating for condo communities across the province. However, we’ve also come to realize that at the end of the day, no matter how streamlined and integrated a condo building might be, we’re only as good as our communities. There’s a special kind of value in giving back to the places we live, and so we embrace every opportunity to do so with gusto. Volunteering has been at the core of who we are since we first started calling ourselves “Catalyst.” To quit now would be not only a disservice to those who rely on our support, but to our own team, too. With that in mind, we continue to fight the good fight and provide support wherever we can. Here are just a few of the things we’ve accomplished over the past 12 months. Let’s start with a big one. Out of all our community initiatives, this might be the one we’re most proud of. 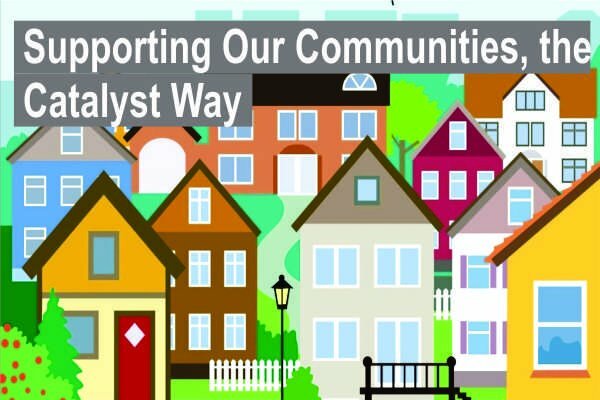 Having been involved with Street CCRED (Community Capacity in: Research, Education, and Development) since its inception at a grassroots level, we are pleased to have played a hand in ushering this community-based organization into incorporation as a non-profit aiding in harm reduction and housing-first initiatives. We’re currently in the process of utilizing our website development and marketing team to build a new online home for this community-minded program (pro-bono, of course), and are eager to collaborate further in order to continue driving change and providing support to those who need it most. Any red-blooded Calgarian spends all year looking forward to the Stampede – but where most people see an opportunity to take advantage of relaxed work schedules and participate in some light day-drinking, we take a bit of a different approach. One of our Catalyst team members looks at Stampede as a way to give back to Calgarians. This year, Catalyst joined BMO for their BMO Kids Stampede Breakfast, waking up to be there at 5AM to serve a warm, free breakfast to over 38,000 hungry folks ready to giddy-up and enjoy the festivities – or, who are just looking to get a bit of food in their bellies, as the case might be. Surely, there are much more exciting things to be doing during Stampede than serving pancakes – like, say, sleeping off the festivities from the night before? Not according to Alandra – one of Catalyst’s Project Managers who also happens to be our most diehard Stampede Breakfast volunteer – not to mention pancake chef extraordinaire. “Volunteering is fun, and it’s good to help out the community,” she explained when we asked her about it. Where’s a white cowboy hat when you need one? While we strive to give back to those living in the communities around us, we’re also always eagerly looking for ways to provide additional services to those condo residents throughout the province –whether they’re Catalyst clients or not. At the end of the day, a healthier, more educated condo community is good for everyone, which is why we always do what we can to teach, engage, and converse with anyone and everyone looking to talk shop. Take CCI, for example. The Canadian Condo Institute (both North and South Alberta chapters) are constantly hard at work cultivating condo knowledge in our province through the structured implementation of seminars and workshops focused on industry topics, related legislation, governance, and more. We’re always eager to attend these incredibly informative learning sessions, and go out of our way to champion these efforts at every opportunity on our blog and throughout our social media channels. Then, there’s ACOC. Now, this acronym isn’t anywhere near as dirty as it sounds – it actually stands for Alberta Condo Owners for Change, so get your minds out of the gutter! Here, we work to facilitate an unbiased forum of discussion amongst condo owners, providing a place to sound off, ask questions, share knowledge, and discuss initiatives with the goal of revolutionizing the condo industry for the better. Together, these two educational outlets demonstrate our commitment to the community in another, separate manner – by doubling down on our mandate to not just manage condo buildings, but to educate, advocate, and create better condo living opportunities for everybody throughout the industry, whether they’re clients or not. We’re proud of what we’ve accomplished over this past year, but we’re definitely not ready to rest on our laurels anytime soon. We’re always looking to engage with non-profits focused on accessible housing initiatives, marginalized populations, or community-building. If you’re affiliated with any such efforts, please contact Catalyst Principle and VP of Operations Drew Spencer personally at (403) 542-6651 to chat about what we can do to help. To learn more about who we are and what we stand for – or, to have your burning condo-related questions answered – get in touch with us today at Catalyst Condo Management, and we’ll do what we can to share our knowledge and help advocate for what matters to you!